VOCED - International searchable database of abstracts of vocational education and training research and policy information. International searchable database of abstracts of vocational education and training research and policy information. 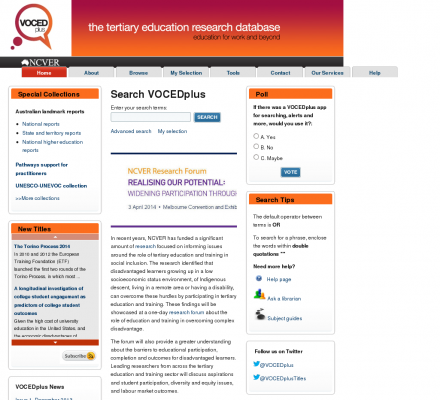 VOCED is a large, free, web-based international database of abstracts on vocational education and training research, policy and practice. It is produced by Australia's National Centre for Vocational Education Research (NCVER), via a national clearinghouse network, and is endorsed by UNESCO. Description: VOCED is a large, free, web-based international database of abstracts on vocational education and training research, policy and practice. It is produced by Australia's National Centre for Vocational Education Research (NCVER), via a national clearinghouse network, and is endorsed by UNESCO.